In current study nanodiamond particles were synthesized, purified and characterized. Then the nanodiamond surface was firstly oxidized to establish a homogeneous layer of COOH groups. Finally, the functionalized particles were deposited on the SiO2 substrate and its anti-polishing behavior was investigated. The resulting products in this research were characterized by FT-TR, TGA, TEM and SEM. Diamond has a very compact structure and it is good insulating material. The presence of any impurities can significantly change the electron levels [1-3]. One of the outstanding features of diamond is its high thermal conductivity which is almost five times more than thermal conductivity of copper . Other physical properties of diamonds are high Young's modulus, high tensile stress, low friction coefficient and a melting temperature of about 4000°C . Furthermore, diamond has a high chemical stability and it cannot react with most acids and alkalis . Diamond naturally is formed under high pressures during a long time. Nano-sized diamond can be prepared through detonation of an explosive deficient in oxygen such that the oxygen cannot oxidize all of the other elements (C, H and N) in the explosive. When such an explosive is detonated, the released free carbon atoms can coagulate and rearrange under the high-temperature and high-pressure condition produced by the detonation reaction, to form Nano-sized diamond crystallites. In the mid-1980s, Nano-sized diamond was found in the detonation residue of some high-energy explosives after they were detonated in inert gas [7,8]. Nano-sized diamond particles have become well-known due to their chemical inertness, tunable surface structures and relatively small and narrow size distribution. These nanoparticles have unique mechanical, electronic, and thermal properties. It should be noted that Nano-sized diamond particles can be stabilized by surface modification with suitable functional groups to protect them from further agglomeration [9-13]. The aim of current study is to functionalize the Nano-sized diamond to prevent agglomeration at first and then coating on the surface of SiO2 lenses. SiO2 substrate is chemically neutral and does not react. After coating the SiO2 substrate with Nano-sized diamond, the optical properties should remain intact. Nano-sized diamond coating on SiO2 substrate induces properties such as hardness of Nano-sized diamond, high-temperatures endurance without impacts on the optical properties of the lens, high pressures tolerance and etc. The final product with this method would be applicable in the camera hatches and the windows of devices which tolerate high temperatures and pressures. With this regard, Nano-sized diamond particles were synthesized and the surface of Nano-sized diamond particles was oxidized by a mixture of mineral acids including H2SO4 and HNO3 acid to establish a homogeneous layer of COOH groups . Then, the ND-COOH was reacted with thionyl chloride to generate acyl chloride groups. The acyl chloride functionalized Nano-sized diamond (ND-Cl) was subsequently reacted with amine-modified glass substrate. All chemicals and solvents were purchased from commercial sources and used directly without further purification. Scanning electron microscopy (SEM) was carried out with a HITACHI S-4160 operated at 30 kV. FT-IR spectra were recorded using the WQF-510A FTIR spectrometer. Thermogravimetric analysis (TGA) was carried out in the temperature range from ambient to 800°C in air atmospheres at a heating rate of 10°C/min using a Mettler thermogravimetric analyzer. Transmission electron microscopy (TEM) images were obtained on a Philips EM 280 transmission electron microscopy with an accelerating voltage of 150 kV. In current investigation Nano-sized diamond particles were synthesized from mixture of TNT and RDX (50/50) by the explosion route . The as synthesized particles were obtained with some impurities including metals and carbons which were removed by applying purification methods like chemical and thermal treatments that will be described in the next sections. Appropriate amount of raw product was mixed with 90 ml of 37% HCl and heated up to 100°C under steering for 1 h. Then a mixture of potassium permanganate and H2SO4 was added and stirred over a night to remove further impurities. Finally, the particles were filtrated and washed and dispersed in 200 ml of HCl/HNO3 with the ratio of 1:1. This mixture was heated and boiled for 2 h to remove all metal impurities. The carbon impurities containing the carbon-like phase have been removed by the thermal oxidation at 400°C for 5 h.
ND-COOH was prepared according to the literature with slight modification . In a typical procedure, 5.0 g of Nano-sized diamond particles, 120 ml of H2SO4 (98%) and HNO3 (68%) (V:V=3:1) were sonicated in a water bath for 30 min. The resulting mixture was stirred at 80°C for 7 days. Then, the reaction solution was separated by centrifugation and the solid residue was completely washed with water. Finally, the samples were dried under vacuum at 60°C overnight to obtain the dry powder of ND-COOH. To convert the carboxyl groups into acyl chloride groups, 0.1 g of ND-COOH was refluxed in 30 ml of toluene contained 10 ml of thionyl chloride (SOCl2 at 70°C for 24 h. Finally, the residual SOCl2 was removed by a rotary evaporator under vacuum and the samples were collected. Briefly, 10 mg of ND-Cl was mixed with 40 ml of o-dichlorobenzene and sonicated in a water bath for 2 h to disperse the ND-Cl in the solvent. Thereafter, it was left to settle for four days to get a stable suspension. Finally, the top 20 ml solution was decanted for future use. The glass substrate was first washed by in piranha solution (7:3 v/v H2SO4/H2O2) at 80°C for 1 hour. Then, it was rinsed with water and dried with the stream of N2 gas. The cleaned glass substrate was immersed in 2% APTES ethanol solution for 30 minutes on a rotation plate. Then, it was rinsed with ethanol. Finally, the resulting substrate was cured at 50°C overnight. The APTES treated glass substrate was put in a 50 ml volume glass bottle. Then, 20 ml stable ND-Cl suspension and a few drops of pyridine were added into the bottle covering the substrate. The bottle was put in the oven at 140°C for 24 hours. After the reaction was completed, the resulting substrate was rinsed with ethanol. The X-ray diffraction (XRD) patterns of the nanodiamond samples are shown in FIG. 1, confirming the obtained products crystallites have a cubic structure. Also the graphitization of the samples is approved. A broad diffraction peak at 2Ɵ=25° belongs to (002) graphite planes (FIG. 1a). This peak disappeared after thermal treatment while (111) diamond planes intensity at 2Ɵ=43.5° increased (FIG. 1b). Also the broaden peaks confirm the small size of the products. Figure 1: XRD pattern of the synthesized samples before (a) and after (b) annealing process. IR spectrum of Nano-sized diamond particles before surface modification is displayed in FIG. 2. The pristine Nano-sized diamond showed obvious peaks of functional groups such as C–H (2783 cm-1 and 2858 cm-1 stretching and 1321 cm-1 bending) and O-H vibrations (3300-3500 cm-1 stretching). Furthermore, a wide weak peak in the 1012-1165 cm-1 region illustrates the presence of C–O and C–O–C ether vibrations . 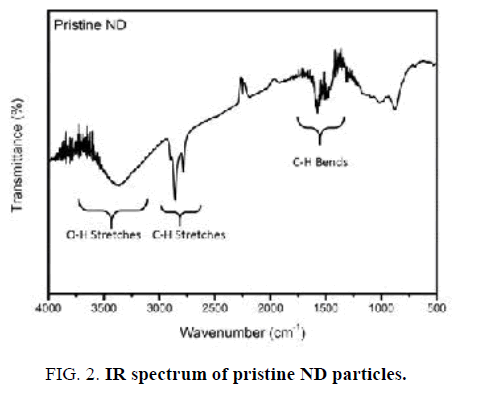 Figure 2: IR spectrum of pristine ND particles. FIG. 3 presents the thermal degradation behavior of Nano-sized diamond particles. Results show that the TGA curve of pristine Nano-sized diamond particles can be divided to four temperature regions. In the first region “I” (30°C-220°C), an initial decrease (∼3 wt %) in weight is observed due to desorption of adsorbed water. In the second region “II” (220°C-400°C), the weight of the sample is approximately constant. It is interesting to note that an increase in the weight of Nano-sized diamond particles is observed in the third region “III” (400°C-520°C) with a maximum around 500°C due to the oxidation of “light” C−H bonds to “heavier” C=O or C−O bonds. In the fourth region (>520°C) “IV”, a significant decrease in weight of Nano-sized diamond particles occurs due to etching of diamond via oxidation in air . The temperature where the decomposition of diamond phase start is 550°C. Importantly, the ND sample had a residual mass of about 60% at 800°C, which indicates the high thermal stability of the Nano diamond material. Figure 3: TGA/DTG curves of the pristine ND particles. 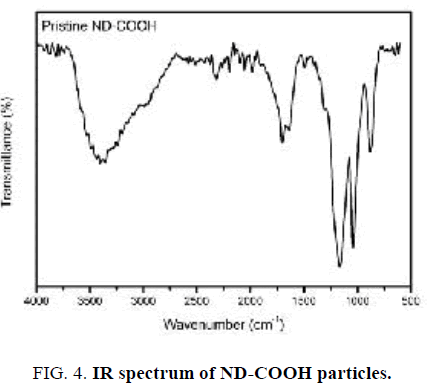 FT-IR spectrum of ND-COOH particles after surface oxidation is shown in FIG. 4. In contrast to pristine Nano-sized diamond particles, FT-IR spectrum of ND-COOH particles shows a strong peak centered around 1720 cm-1, which is attributed to the carbonyl group (C=O). In addition, the weaker band in the 3000-3700 cm-1 is related to the O−H stretching vibrations [18,19]. Figure 4: IR spectrum of ND-COOH particles. The thermal stability of ND-COOH sample was investigated using TGA (FIG. 5). It should be noted that ND-COOH sample shows higher water loss of about 3% in comparison with pristine ND sample upon heating from room temperature to 180°C. This indicates that ND-COOH is somewhat more hydrophilic than pristine ND due to the presence C=O groups on the surface of ND-COOH. In addition, a significant decrease (10%) in the weight of ND-COOH particles is observed in the 200°C-550°C [20,21]. 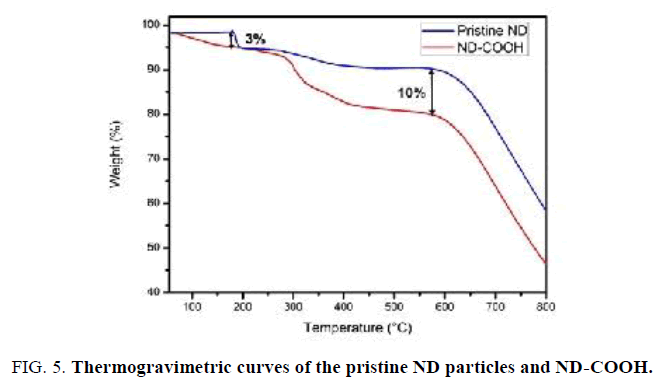 Figure 5: Thermogravimetric curves of the pristine ND particles and ND-COOH. The first indication of successful surface chlorination with thionyl chloride was analyzed by FT-IR (FIG. 6). A sharp intense peak at 790 cm-1 appeared that can be assigned to the presence of C-Cl group stretching vibration . It is worth noting here that the C=O and O-H vibrations are not observed in this spectrum, indicating chlorination has occurred completely. 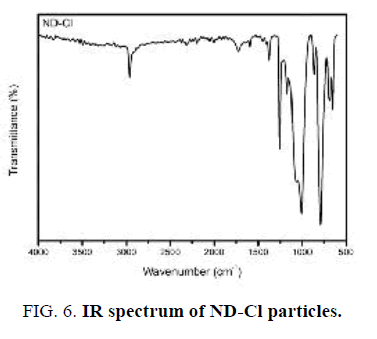 Figure 6: IR spectrum of ND-Cl particles. 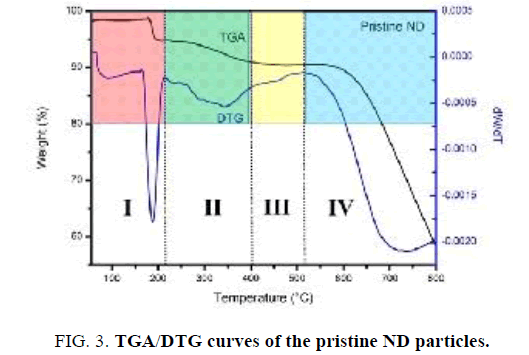 The thermal stability of ND-Cl material was studied by TGA (FIG. 7). It should be noted that ND-Cl sample shows lower water loss of about 4% in comparison with ND-COOH sample upon heating from room temperature to 200°C. This indicates that ND-Cl is less hydrophilic than ND-COOH due to the presence C-Cl groups on the surface of ND-Cl. TEM images were applied to investigate the size of the Nano-sized diamond before and after functionalization. With this regard TEM images of the pristine Nano-sized diamond particles (FIG. 8a) and ND-COOH particles (FIG. 8b) were obtained and it was confirmed that reaction condition did not have significant effect on the size and agglomeration of the particles. Figure 7: Thermogravimetric curves of the ND-Cl and ND-COOH particles. Figure 8:TEM images of the pristine ND particles (a) and ND-COOH particles (b). The successful coating of the glass substrate with Nano-sized diamond particles is confirmed by SEM images. As shown in FIG. 9a, b no particles are observed on the surface of the glass substrate before modification. On the other hand, FIG. 9c clearly exhibit that the surface of glass substrate was successfully coated by Nano-sized diamond particles. It should be noted that a high-magnification SEM image (FIG. 9d) reveals that the thickness of the ND-coated substrate is less than 100 nm. Figure 9: SEM images of glass substrates before modification (a and b) and after coating with ND particles (c and d) at different magnifications. The polishing experiments were done with the use of laboratory-scale machine consisting of two rotary shafts independently driven by electric motors and a container filled with abrasive materials. The substrate was put at the bottom of the container associated with spindle B. The abrasive grinding wheels and the polishing pads were fixed on spindle A, where the polishing load of 1.5 N was applied. 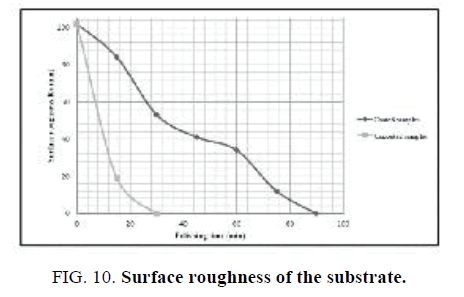 The surface roughness of the substrate before and after modification with Nano-sized diamond was investigated as function of polishing time. As can be seen in FIG. 10 surface coating by Nano-sized diamond improves its roughness in comparison with uncoated samples. Figure 10:TEM images of the pristine ND particles (a) and ND-COOH particles (b). The ND particles were synthesized by explosion route and the impurities including metals and carbon have been removed by method of the acidizing and thermal oxidation, respectively. The purified samples were coated on glass substrate via chemical routes. The substrate was then studied and it was observed that Nano-sized diamond coating of the substrate increased its roughness. The authors are grateful to the University of Tehran for their effort to provide financial support to undertake this work. Maier F, Riedel M, Mantel B, et al. Origin of surface conductivity in diamond. Physical Review Letters. 2000;85(16):3472. Gu E, Choi HW, Liu C, et al. Reflection/transmission confocal microscopy characterization of single-crystal diamond microlens arrays. Applied Physics Letters. 2004;84(15):2754-6. Savvides N. Optical constants and associated functions of metastable diamondlike amorphous carbon films in the energy range 0.5-7.3 eV. J App Phy. 1986;59(12):4133-45. Graebner JE, Jin S, Kammlott GW, et al. Large anisotropic thermal conductivity in synthetic diamond films. Nature. 1992;359(6394):401. Kaner RB, Gilman JJ, Tolbert SH. Designing super hard materials. Science. 2005;308(5726):1268-9. Troupe CE, Drummond IC, Graham C, et al. Diamond-based glucose sensors. Diamond and Related Materials. 1998;7(2-5):575-80. Korobeinichev OP, Ermolin NE, Chernov AA, et al. Flame structure, kinetics and mechanism of chemical reactions in flames of mixed composition based on ammonium perchlorate and polybutadiene rubber. Combustion, Explosion and Shock Waves. 1992;28(4):366-71. Greiner NR, Phillips DS, Johnson JD, et al. Diamonds in detonation soot. Nature. 1988;333(6172):440-5. Schrand AM, Hens SA, Shenderova OA. Nanodiamond particles: Properties and perspectives for bioapplications. Critical Reviews in Solid State and Materials Sciences. 2009;34(1-2):18-74. Mochalin VN, Shenderova O, Ho D, et al. The properties and applications of nanodiamonds. Nature Nanotechnol. 2012;7:11-23. Shenderova OA, McGuire GE. Science and engineering of nanodiamond particle surfaces for biological applications. Biointerphases. 2015;10(3):030802. Nagl A, Hemelaar SR, Schirhagl R. Improving surface and defect center chemistry of fluorescent nanodiamonds for imaging purposes-a review. Analytical and Bioanal Chem. 2015;407(25):7521-36. Jabeen S, Kausar A, Muhammad B, et al. A review on polymeric nanocomposites of nanodiamond, carbon nanotube and nanobifiller: Structure, preparation and properties. Polymer-Plastics Technol and Eng. 2015;54(13):1379-409. Efremov VP, Zakatilova EI. The analysis of thermal stability of detonation nanodiamond. J Phy: Conference Series. 2016;774(1):012014. Cheng J, He J, Li C, et al. Facile approach to functionalize nanodiamond particles with V-shaped polymer brushes. Chemistry of Materials. 2008;20(13):4224-30. Wang Z, Xu C, Liu C. Surface modification and intrinsic green fluorescence emission of a detonation nanodiamond. Journal of Materials Chemistry C. 2013;1(40):6630-6. Stehlik S, Varga M, Ledinsky M, et al. Size and Purity Control of HPHT Nanodiamonds down to 1 nm. The Journal of Physical Chemistry C. 2015;119(49):27708-20. Kozak H, Remes Z, Houdkova J, et al. Chemical modifications and stability of diamond nanoparticles resolved by infrared spectroscopy and Kelvin force microscopy. J Nanoparticle Res. 2013;15:1568-72. Chung PH, Perevedentseva E, Tu JS, et al. Spectroscopic study of bio-functionalized nanodiamonds. Diamond and Related Materials. 2006;15(4-8):622-5. Wahab Z, Foley EA, Pellechia PJ, et al. Surface functionalization of nanodiamond with phenylphosphonate. Journal of Colloid and Interface Science. 2015;450:301-9. Bousa D, Luxa J, Mazanek V, et al. Toward graphene chloride: Chlorination of graphene and graphene oxide. RSC Advances. 2016;6(71):66884-92. Lisichkin GV, Korol?kov VV, Tarasevich BN, et al. Photochemical chlorination of nanodiamond and interaction of its modified surface with C-nucleophiles. Russian Chemical Bulletin. 2006;55(12):2212-9.